Are you looking for an exquisite vodka chilling set to give as a gift? Waterford Crystal offers a variety of options that are sure to impress! These vodka chill bowl sets act as beautiful show pieces in addition to helping you serve the perfect chilled vodka! The team here at SimplyVodka.com has picked out the three crystal vodka chilling sets seen below. Crystal vodka chilling sets make great wedding or other special occasion gifts for those who enjoy vodka. See our top picks below to find the perfect vodka chilling set to fit your budget. Current prices range from $379 to $2,000 for these Waterford Crystal sets and all three are currently available on Amazon Prime. This stunning Diamond Vodka Set in Chill Bowl with Silver Insert makes such a stunning addition to any bar collection; with a radiance that showcases chilled vodka perfectly.The Lismore Diamond pattern is a strikingly modern reinvention of the Waterford classic; characterized by intricate diamond cuts rendered in radiant fine crystal. Set includes: Chill Bowl, Silver Insert, and 12 Shot Glasses. Jo Sampson’s Elysian collection for Waterford is the ultimate in luxury and elegance for home entertaining. With a distinct nod to old world opulence whilst embracing a modern aesthetic. 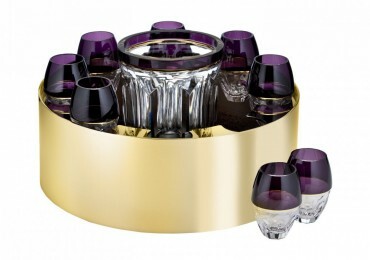 The diverse collection invites the curation of a personalized drinking experience, with interplay between proportion, weight and size, and subtle differences between the clear and amethyst crystal.